High performance wall and ceiling systems from Dubai-based Gyproc Middle East are helping to create luxury interiors for guests at Starwood Hotels and Resorts new hotel development in Muscat, Oman. 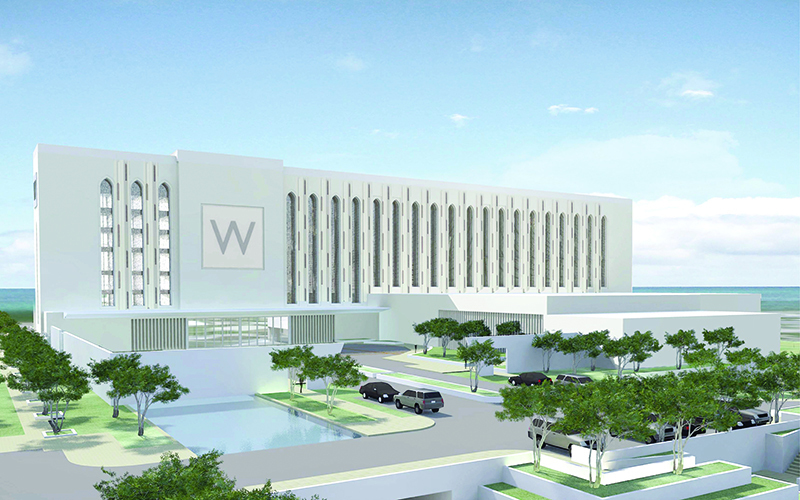 The new 290-bedroom W Resort Hotel, located adjacent to the Royal Opera House in Muscat’s Shatti Al Qurum district, is the latest in Starwood’s W-Resort portfolio of design-led luxury hotels. The 5-star development includes super-luxury suites and a royal villa, as well as spa facilities, multiple dining venues, swimming pools and a ballroom plus retail space and a business centre. To ensure the high standards of acoustics and fire performance needed to support the development’s ‘luxury’ profile, Gyproc wall and ceiling systems have been specified throughout the 9-storey building. A demanding Rw 62dB acoustic requirement between rooms and corridors is being achieved using a single frame GypWall CLASSIC system in combination with Gyproc RB1 Resilient Bar to minimise wall thickness and maximise available room space for guests. Tall lobby walls have been achieved using a solution based on an SFS structural steel framing system, whilst high quality monolithic ceilings are created using the Gyproc MF concealed grid suspended ceiling system. Risers for MEP systems and shafts have been constructed from Gyproc’s ShaftWall system, a solution that can be constructed from one side only, enabling shafts to be created quickly and efficiently. Fast becoming the preferred construction method for internal walls, partitions and ceilings in hotels, hospitals, schools and commercial buildings, the lightweight engineered metal systems are ideal for multi-storey construction where access and internal manoeuvring space are often limited, allowing drywall subcontractor, Zubair Furnishing LLC to work quickly to meet the clients tight cost and project delivery timetable.